In cosmology, dark energy is a hypothetical form of energy that would be distributed throughout space and tends to accelerate the expansion of the Universe. The main feature of dark energy is to have a strong negative pressure. According to the theory of relativity, the effect of this negative pressure would be similar, qualitatively, a force acting on a large scale in opposition to gravity. This hypothetical effect is often used for various current theories that attempt to explain the observations that point to a universe in accelerated expansion. The nature of dark energy is one of the biggest current challenges in physics, cosmology and philosophy. There are now many different phenomenological models, however observational data are still far from selecting one over the other. This happens because the choice of a model of dark energy depends on a good knowledge of the temporal variation of the expansion rate of the universe which requires the observation of properties of objects at very large distances (observations and distance measurement at high redshifts). The main forms of different proposals for dark energy is the cosmological constant (which can be interpreted either as a modification of geometric nature in the field equations of general relativity, and as an effect of vacuum energy, which fills the universe so homogeneous); and the quintessence (usually modeled as a scalar field whose energy density can vary in time and space). Another relatively popular among researchers proposed quartessência is aimed at unifying the concepts of dark energy and dark matter by postulating the existence of a form of energy known as Chaplygin gas that would be responsible for both effects of two dark components . In \(1929\), American astronomer Edwin Hubble studied exploding stars known as supernovae to determine that the universe is expanding. Since then, scientists have sought to determine just how fast. It seemed obvious that gravity, the force which draws everything together, would put the brakes on the spreading cosmos, so the question many asked was, just how much was the expansion slowing? The general expectation was that the cosmic expansion would gradually decrease, since the galaxies exert a gravitational force on its other. There was therefore a huge surprise in 1998 when two teams of astronomers working independently announced that the expansion was actually getting faster. Both teams drew on the explosion of supernovae of type Ia (see Figure 1). These explosions are so bright they can be seen at a distance of billions of light years. The light from an object that is, for example, five billion light years takes five billion years to reach us; in other words, we observe the universe as it was five billion years. Supernovae were found farther than expected for a universe moved only by inertia - which indicated an acceleration signal. The current best explanation for the unexpected acceleration of the Universe is dark energy, a form of energy whose density is almost exactly the same or perhaps everywhere and always. His persistence would provide a constant repulsive force to the universe, thus accelerating its expansion. Calculating the energy needed to overcome gravity, scientists determined that dark energy makes up roughly \(73\) percent of the universe. Dark matter makes up another \(23\) percent, leaving the "normal" matter that we are familiar with to make up less than \(4\) percent of the cosmos around us. Knowing how dark energy affects the spreading universe only tells scientists so much. The properties of the unknown quantity are still up for grabs. Recent observations have indicated that dark energy has behaved constantly over the universe's history, which provides some insight into the unseen material. One possible solution for dark energy is that the universe is filled with a changing energy field, known as "quintessence." Another is that scientists do not correctly understand how gravity works. The leading theory, however, considers dark energy a property of space. Albert Einstein was the first to understand that space was not simply empty. He also understood that more space could continue to come into existence. In his theory of general relativity, Einstein included a cosmological constant to account for the stationary universe scientists thought existed. After Hubble announced the expanding universe, Einstein called his constant his "biggest blunder." But Einstein's blunder may be the best fit for dark energy. Predicting that empty space can have its own energy, the constant indicates that as more space emerges, more energy would be added to the universe, increasing its expansion. Although the cosmological constant matches up with observations, scientists still aren't certain just why it fits. 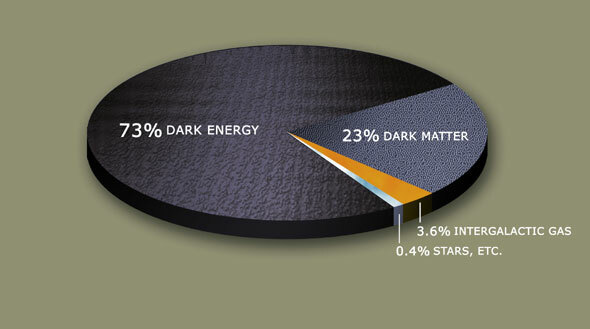 Dark energy makes up most of the universe, but dark matter also covers a sizeable chunk. Comprising nearly \(27\) percent of the universe, and \(80\) percent of the matter, dark matter also plays a dominant role. In the \(1950s\), scientists studying other galaxies expected gravity to cause the centers to rotate faster than the outer edges, based on the distribution of the objects inside of them. To their surprise, both regions rotated at the same rate, indicating that the spiral galaxies contained significantly more mass than they appeared to. Studies of gas inside elliptical galaxies and of clusters of galaxies revealed that this hidden matter was spread throughout the universe. 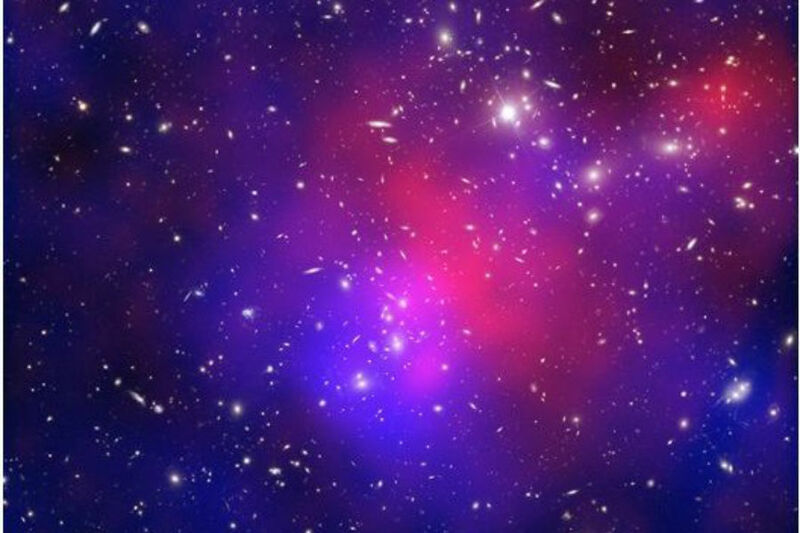 Scientists have a number of potential candidates for dark matter, ranging to incredibly dim objects to strange particles. But whatever the source of both dark matter and dark energy, it is clear that the universe is affected by things that scientists can't conventionally observe. The most accepted explanation about the nature of dark energy is that it is the energy of the vacuum, a perfectly uniform energy present in the empty spaces anywhere in the Universe. The authorship of this idea goes back to Einstein, who introduced the "cosmological constant" in his Theory of General Relativity in \(1917\). At the time, astronomers thought the universe was neither expanding nor decelerating, and he then used the cosmological constant to compensate for the gravitational attraction of matter. When Edwin Hubble discovered the cosmic expansion in \(1929\), Einstein realized that the cosmological constant was not needed and discarded the concept that would later call (according to physicist George Gamow) of "its most crass scientific error". The energy of the vacuum is not a gas, a fluid or any other substance; is more a property of space-time itself. It is simply the minimum amount of energy present in any region of space, the energy that remains when we remove all kinds of "stuff" that region. In general relativity, this amount can be positive or negative, without any particular reason to be zero. The microscopic world obeys the laws of quantum mechanics, which proclaim that our understanding of the state of any system involves an inevitable uncertainty (the famous uncertainty principle of Werner Heisenberg). Energy fields, so it will float in empty space, since we can not determine that empty space has zero energy. These "vacuum fluctuations" virtual particles appear and disappear in a split second. These particles contribute to the vacuum energy, but are not its sole cause, since general relativity allows us to assume an arbitrary vacuum energy without taking into account these fluctuations. Einstein certainly was not thinking about virtual particles conceived when the cosmological constant. If dark energy is actually observed vacuum energy, then it will be very little: the amount of it within the volume of the Earth is not greater than the average annual electricity consumption in Brazil. In fact, dark energy is observed over one hundred and twenty orders of magnitude below the most naive estimates for its value. We know since \(1998\) that the universe is expanding rapidly. But does this acceleration will continue forever? If so, what will be the fate of clusters of galaxies, galaxies and stars? The answer to these questions depends on an intricate balance between the geometry of the Universe and the properties of this subtle form of energy, dubbed "dark energy" which pervades all space. A cosmos without dark energy, general relativity states that the ultimate fate of the Universe is completely and unequivocally determined by its geometry . A Universe with positive curvature, like the surface of a sphere, eventually implode (such universe is said closed). A universe geometrically flat (Euclidean) or negative curvature, like the surface of a saddle, expands indefinitely (this is an open Universe). The existence of dark energy considerably complicates the situation. If it is in fact the energy associated with the vacuum - a possibility that is consistent shows on the last observations of supernovae, of clusters of galaxies and the cosmic background radiation - then its energy density remains constant, whereas the energy densities of both the subject and the radiation continuously decreasing as far as the universe expands. This means that dark energy begins to prevail when the universe becomes sufficiently large. For an equation of state parameter \(w = -1\), characterizing the vacuum gives the dominance of dark energy regardless of the sign of the geometric curvature. Since dark energy produces a repulsive force to gravity, cosmic expansion started to accelerate, as observed in our Universe today. If the expansion of our universe is governed by vacuum energy, then continue to accelerate, eventually resulting in a red shift: all galaxies are more distant than two dozen forming approximately our Local Group will as far that it can not be longer detect them. In other words, astronomers living in the Milky Way in \(100\) billion years will not be able to observe no galaxies outside our Local Group. Indeed, such astronomers (assuming there then) even be able to observe the cosmic background radiation, because she too will suffer redshift. Size cosmic isolation and eventual death in a "big cooling" is not the worst of all possible fates of the universe. The "big rip" and other possible destinations. Big Crunch : Universe will collapse if Dark matter is the dominant force. 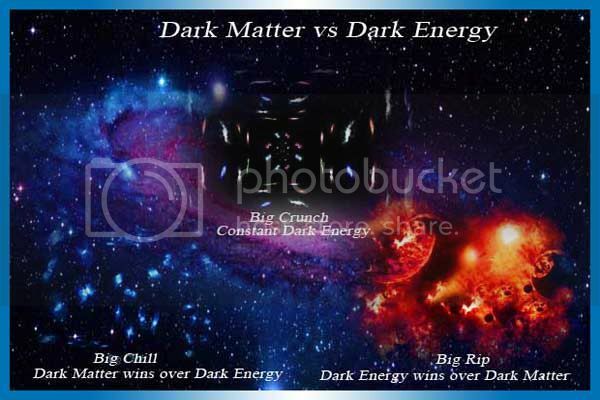 Big Rip : It will be ripped to pieces if Dark Energy wins over Dark Matter. Big Chill : If dark energy wins over Dark Matter but remain constant, our universe will end up in Big Chill. But what is this dark energy? We know that the density is nearly constant in time and space, but do not know what is fact, and understand the true nature of this energy may be the biggest chal-lenge of physics today. Thanks ! I hope that it Can Help You ! Do you have any websites to research further? Seeking knowledge you'll get , everything is a search! Nice note. You spelt mystery wrong in the title, but otherwise it was perfect. @Gabriel Merces Thanks a lot. .
Nice note.Could you please tell source of information ? No, but I would be remissed if I didn't point it out.